Several public health sanitarians at the Lake County General Health District shared their story behind the Food Safety Ninja website. NEHA interviewed Davene Sarroco-Smith, REHS/RS about the project and the engaging content that was produced. NEHA: What inspired the Food Safety Ninja videos, and how did this project come together? NEHA: How did Lake County determine the most important topics for the videos? Was this a collaborative effort or did the department work together? Davene: The bulk of the FDA grant was to accomplish Standard 9 of the Voluntary National Retail Program Standards. We did the baseline survey and took into consideration the 5 CDC risk factors for foodborne illness and arrived at these six food safety categories. The videos were made as a tool to use to help educate our food operators. As of the middle of this March, as the sanitarians do their food establishment inspections, if an establishment has a violation in any of the six categories they are given a postcard. 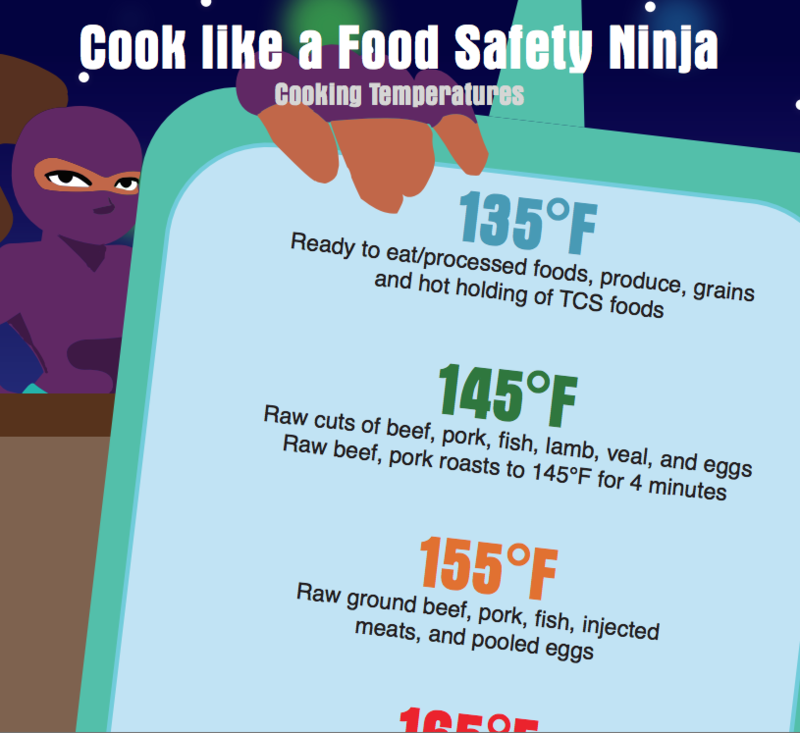 The postcard directs them to the FoodSafetyNinja.org website that was also created as a part of the FDA grant. They are required to complete the educational modules as part of their corrective action. The videos are one of three components in a module. The other components are a short narrative and a 5 question quiz with rotating questions and answer positions. Each location logs in under an assigned number so we can track that the modules have been completed and passed. The usage is constant. NEHA: Have the videos been successful and utilized often? Davene: We have received a lot of positive feedback from industry and regulatory about our videos. Once we have used the videos, modules, and new educational materials for a year, we will re-survey our establishments in the hopes that we have improved food safety in Lake County, Ohio. The website and its contents are accessible to anyone not just licensed operators that were sent there for corrective action. What brought you (and any others you’d like to share these questions with) to the profession of environmental health? Davene Sarrocco-Smith, REHS/RS: I was getting a Bachelor of Science degree in Biology and did not know what I was going to do with it. In the biology wing of the University of Akron a flier was on the wall about Certification in Environmental Health with paid internship. The paid internship caught my eye and I joined the certification program and interned at the Summit County Health Department. Loved it and here I am 29 years later still loving environmental health. Amanda Elliott, RS: I have always had a passion for the environment and public health. While attending Kent State University I studied public health with a concentration in sanitation. During my internship at the Lake County General Health District I was offered a Public Health Sanitarian position. I have been a sanitarian for six years, so I guess everything just fell into place. Christy Armstrong, RS: I have been in Public Health for over 18 years. They didn’t have a Public Health major when I was in school, but I received a degree in Environmental Science. I had a single class in Environmental Sanitation, which was taught by a Registered Sanitarian. Like most of us, he had a fantastic story to go with every topic we learned. Once I graduated, I found a job advertised for a Registered Sanitarian, and thanks to my class (and my teacher), I knew it was a good fit for me! Anne Lustig, RSIT: When I transitioned from teaching it was to pursue a biology degree with a concentration in environmental science. Originally, my focus was aimed at water quality since water is one of those things you can’t live without. The beach program is primarily what sparked my interest with the health department. From there, it expanded to an understanding that other programs, such as storm water monitoring and sample monitoring of National Pollutant Discharge Elimination System (NPDES) household sewage treatment systems, link to overall water quality as well. Once I realized how many other programs the health district had and the benefits of them, I decided to obtain my Registered Sanitarian in Training (RSIT). As a RSIT I have only been with the health district about six months. Food Safety is an integral part of the work that is done at NEHA. For decades, NEHA has worked closely with health departments in every state to offer the most up-to-date food-safety information and to keep abreast of food-safety trends. NEHA offers food safety learning materials and credentials for all professionals in the culinary and hospitality industries. In addition, NEHA Food Safety Instructors train those starting out in the culinary and hospitality industries to become knowledgeable about best food safety practices. Find more fun food safety resources, info sheets, and videos at the Food Safety Tools page.